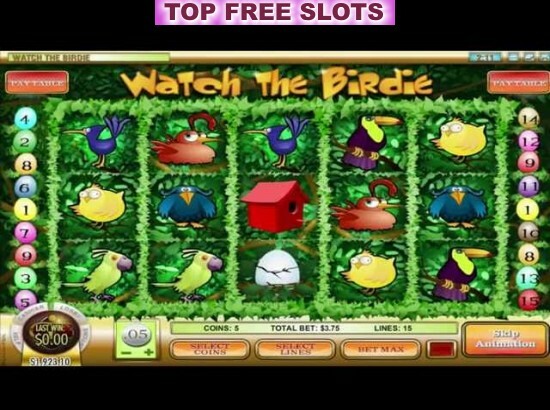 You Gotta Love This Slot If You Like Birds! 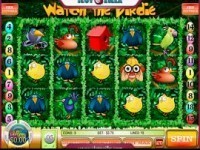 Watch the Birdie is a fruit machine, which you should certainly try if you want to have fun online and win real money. Frankly speaking, it is ideal for players who love nature. It boasts excellent multimedia effects, vivid graphics, stunning features, and huge winning possibilities. Needless to add, this slot is powered by Rival, thus, you may count on prime quality soft, 100% secure gaming and generous bonuses. Once getting started, you will meet lots of different birds, every of which will have you laughing for long. You will simply adore these fun colorful characters: Crow, Canary, Bird Egg, Blue Parrot, Cockatoo, Songbird, and a Toucan, Mountain Bluebird, Red Bird House, Red Crowned Crane, and Birdwatcher. As to the features, this five- reel (non-progressive), 15-payline slot of a bird watching theme boasts a wild, a scatter and free spins. There is also an exciting bonus round. The Wild Egg icon is the wild. The Birdwatcher is the scatter icon. Coin denominations range from 0.01 to 2 dollars. The maximum bet is $ 75. Big Top Slot - 9 Line Slot Machine. Lucky Panda - New Free Spins 100 Line Slot Machine. HipHopopotamus - Bonus Feature Fruit Machines game. 2 New Exciting i-Slot Games Bust-A-Vault And Psychedelic Sixties Launched At Slotocash Online Casino. Bust-A-Vault Rival's first 3-reel with..